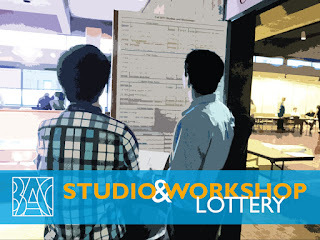 The following rosters represent the official Studio Lottery results as determined by the Dean (Karen) and appropriate Directors (Kerri and Kyle). All students will be enrolled by the BAC Registrar by Friday evening. If a student identifies a scheduling conflicts during registration period, he or she may email the appropriate Administrator (above) to request a change. No changes can be made via self-service, and all changes are made between Kerri, Kyle or Karen and the Registrar’s office. WED 4-10:15pm *Note the time change!